Using a slow shutter speed is a fun way to add some creative flair to your photos. Once you’ve learned the technical aspects of shutter speed, you’re ready to get out there and practice. If you’re in the market for a new camera and you know you’re interested in experimenting with slow shutter speeds, check out our list of the 5 best slow shutter speed cameras. As you learned in our Ultimate Shutter Speed guide, the longer the shutter is open, the more light is allowed to hit the sensor. When you’re shooting with extremely slow shutter speeds in areas with a lot of light, it’s easy to accidentally overexpose your photos. This often results in blown highlights that may be unrecoverable in post-production. To combat this, you’ll want to set your ISO as low as possible if you’re planning to use a slow shutter speed in a fairly well-lit area. Most DSLRs have a minimum ISO of 100, but some professional-grade models will allow you to go as low as ISO 32. A lower ISO means less light sensitivity, so you can keep the shutter open for a long time without overexposure. Camera models without the ability to go below ISO 100 might lead to slight overexposure in bright areas. This can be compensated for with a neutral density (ND) filter. Most DSLRs on the market today will allow you to shoot at shutter speeds as long as 30″ (30 seconds). This is sufficient for most slow shutter speed photography. However, if you want to be able to push past the 30″ mark, you’ll need to opt for a camera with bulb mode. Bulb mode is used commonly for extremely long exposures. Photographers often use exposure times of 30 minutes or more to capture very slow-moving subjects (think star trails). If you’d like to experiment with this type of photography, be sure to purchase a camera with bulb mode, as well as a remote cable release to use it with. If you’re a hobbyist photographer or an amateur just looking to hone your skills, an entry-level or mid-range DSLR will give you plenty of control over your photos without breaking the bank. Professional camera bodies alone can cost several thousand dollars – and remember, you’ll have to purchase the right lenses too. If your budget is fairly flexible or if you’re a professional looking for a heavy duty camera, you’ll probably want to splurge on a pro-level camera. These cameras most often use full-frame sensors instead of cropped sensors and feature a multitude of extra features. If you spend a lot of time traveling or want something to take on the go, you might want to consider a compact camera body. Compact DSLRs take up less space and weigh less, giving you plenty of room for extra lenses and accessories. However, the size of a camera is often directly related to its level of advanced features. If you’re a pro looking for a serious camera, you might be less concerned with the convenience of a compact DSLR and more concerned with the quality of the pictures you’re able to capture. whether you want to shoot star trails and other slow shutter images or you just want to experiment with slow shutter speeds, there is a right camera fit for you. Take a look at my top 5 list and let me know what you think in the comments. This pro-level camera is a real workhorse. The D810 is an evolution of Nikon’s D800 and D800e, boasting noticeably improved autofocus and a more expansive ISO range. With 36 megapixels, photos come out razor sharp and filled with detail. Obviously, bulb mode is best used with a tripod to eliminate camera shake – hand-holding your camera for a minute or more is pretty much out of the question. Most photographers also use a device called a cable release when using bulb mode. The cable release is a small remote that allows you to lock the shutter button down for a prolonged exposure without having to keep your hand on the shutter button. The expansive ISO range of the D810 is ideal for shooting with slow shutter speeds. With the ability to shoot with an ISO as low as 32 (versus most DSLRs which only go down to 100), you allow your camera’s shutter to stay open longer without overexposing your image. While using higher ISOs allows you to shoot at faster shutter speeds, using a lower ISO allows you to shoot at slow shutter speeds while maintaining proper exposure. Weight: 2 lb., 2.6 oz. For night photography, the D810 includes a unique long-exposure noise reduction function to reduce the amount of noise in your photographs. This is ideal for nighttime photography using long exposures and high ISOs, which can cause excess noise and graininess. 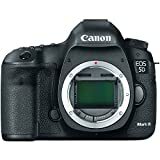 Canon’s EOS 5D Mark III is the go-to professional level DSLR for Canon enthusiasts. This mid-size DSLR combines an impressive 22 megapixels, 61 point AF sensor and expansive ISO range for a camera that is both versatile and capable of taking gorgeous photographs. Like the Nikon D810, Canon’s 5D Mark III uses bulb mode to create long exposures. Bulb mode is indicated by the letter “B” after scrolling past the slowest shutter setting while in Manual (M) or Shutter Priority (Tv) mode. A number of cable releases are available to fit Canon cameras. Canon offers its own version, while third party vendors offer remotes compatible with the 5D Mark III. You’ll find that the third party versions are often much less expensive and work just as well, so shop around to find one that suits your needs. While the 5D Mark III’s native ISO range is fairly standard among pro-level DSLRs, the ability to expand it down to ISO 50 is helpful when shooting with extremely slow shutter speeds. Although it’s not quite as expansive as the D810, most photographers will find that ISO 50 is sufficient for preventing overexposure with slow shutter speeds. If you’re interested in exploring slow shutter speed photography but not ready to take the plunge for a pro-level camera, Canon’s EOS Rebel T6i might be the perfect solution. Considered a more entry level DSLR, the Rebel T6i combines 24.2 megapixels and stunning image quality with a simple user interface. To boot, it’s offered at a much more affordable price than its pro-level big brothers. Just like the 5D Mark III, the Rebel T6i has a maximum exposure time of 30″ unless you put it into bulb mode. To do this, select either Manual or Shutter Priority (‘Tv’ on your mode dial) and scroll past the 30″ mark. res, use a tripod to eliminate camera shake. The Rebel T6i doesn’t offer quite the same expansive ISO range as some of its pro-level companions. This means that your sensor might pick up too much light during long exposures in fairly bright areas, resulting in blown highlights. This minor annoyance is easily remedied with the use of a neutral density (ND) filter, which can be purchased separately in a variety of sizes to fit your lens. Nikon’s D5500 is another mid-range DSLR bridging the gap between entry-level and professional equipment. Armed with 24 megapixels and Nikon’s latest EXPEED 4 processor, the ultra-compact D5500 delivers impressive images in a surprisingly small package. The D5500’s slowest automatic shutter speed is 30″ but this can be overridden in bulb mode. Unlike the previous cameras in our list, bulb mode is only available in Manual exposure mode on the D5500. If the camera is switched to Shutter priority mode (S), you will not be able to activate bulb mode. This means you’ll have to set your aperture as well as your shutter speed. Like the Rebel T6i, the D5500’s minimum ISO is 100. If you’re planning to use slow shutter speeds in well-lit areas, you might need a neutral density (ND) filter to prevent overexposure and blown highlights. Pentax’s K-S2 is the perfect solution for the budding photographer in search of high quality on a limited budget. Rated 2016’s Best DSLR Under $500 by Gadget Reviews, this 20 megapixel camera delivers quality images at a fraction of the cost of its pricier counterparts. And as an added bonus, its body is sealed for weather resistance, so you can take it with you pretty much anywhere. Like the other cameras on our list, the Pentax can be stopped down to a shutter speed of 30″ or pushed into bulb mode for ultra-long exposures. If you’re planning to make use of bulb mode, you’ll want to invest in a cable release. Be sure to ensure that the cable release you choose is compatible with this model, as they are not all interchangeable. Although the K-S2 pushes the limits of ISO into a range higher than many of its entry-level companions, it doesn’t offer the ability to dip below ISO 100. For slow shutter speeds in well-lit areas, consider a neutral density (ND) filter to prevent overexposure. What slow shutter speed camera will you buy? Please share your opinion in the comments below and share this review with your friends!